Bluish green herb; 2-3 feet tall. If stems or leaves are broken they exude a yellow (or white) juice. Thistle-like leaves and stems with sharp bristles. 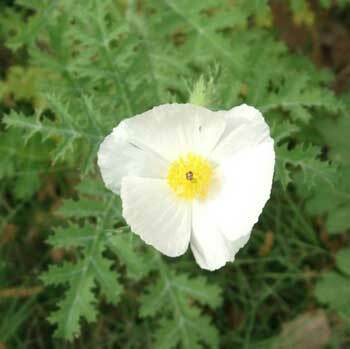 The white poppy-like flowers with 4-6 petals at least 2 inches wide; May to September. Found in waste places; scattered. Connecticut to Florida; Texas to Missouri, Illinois. Seed tea is emetic. Plant infusion used for jaundice, skin ailments, colds, colic, and wounds. Externally used for headaches. Folk remedy for cancers, itching and scabies. The seeds, leaves and stem juice have been used medicinally, but the plant is generally considered poisonous. This herb contains toxic alkaloids. Seed oil caused glaucoma and edema.